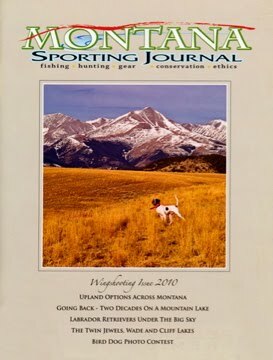 >A client sent me an email the other day to inform me that his bird dog, Rocky, got 15 minutes of fame…he’d made the cover of the Montana Sporting Journal’s Wingshooting issue 2010. Of course, I had to get my hands on a copy. I searched all the local bookstores high and low to no avail…similar to my last weekend of blue grousing! Thank heavens MSJ’s Website was on the world wide web. What a wonderful magazine editor Jay Hanson (fellow setterman) has put together! MSJ Wingshooting Issue 2010 is loaded with awesome articles and pictorial sagas to stimulate bird-dogging/fly fishing enthusiasts salivating like Pavlov’s-bell-conditioned-dogs! My favorite saga is entitled Runnin’ & Gunnin’ Huns. My personal nemesis bird…the birds I love to hate! Inspiring photographs and prose! There is even an article by Don Thomas!